Patent medicines are named after the “letters patent” granted by the English crown. The first “letters patent” given to an inventor of a secret remedy was issued during the late 17th century. The patent granted the medicine maker a monopoly over his particular formula. The term “patent medicine” came to describe all pre-packaged medicines sold “over-the-counter” without a doctor’s prescription. In the United States very few preparations were ever actually patented. Many of the earliest English patent medicines, such as Turlington’s Balsam of Life, Bateman’s Pectoral Drops, and Hooper’s Female Pills, were very successful within the American colonies. Some of these medicines survived well into the 20th century, such as Dicey’s Dr. Bateman’s Drops, whose original patent was granted by King George I in1726. 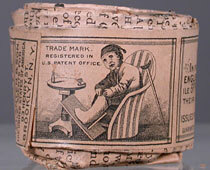 It did not take long for Americans to cultivate their own patent medicines. The numbers and types of medications grew steadily in the decades leading up to the Civil War. The patent medicine trade was very lucrative, encouraging many enterprising individuals to launch their own brands. Balm of America was a typical American patent medicine, produced by Boston pharmacist Thomas Hollis in the 19th century. During the Civil War the United States taxed patent medicines along with matches, playing cards, perfumes and other proprietary articles to fund the war effort and repay military debt. From 1862 to 1883, the United States required tax stamps such as the one on a bottle of Z.C. Alden’s Catarrh Cure to be placed on all packaged medications. The government returned to patent medicine taxation during the Spanish American War (1898-1902), using a distinctive “battleship” stamp, as seen on the box of Warner’s Safe Asthma Cure. The second half of the 19th century is considered to be the golden age of American patent medicines. Rapid increases in industry and manufacturing, urban living, advertising in national newspapers and magazines, and the absence of drug regulation all contributed to a boom in the production and consumption of patent medicines. 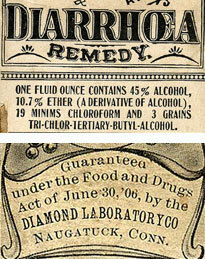 Many people turned to patent medicines out of fear and distrust of contemporary medical practices. This was the period of “heroic medicine,” in which extreme techniques such as bloodletting and the use of harsh purgatives and emetics were often employed by physicians. Working before the advent of germ theory at the end of the 19th century, regular physicians had few therapies that could compete with the patent medicine industry’s promise of easy health in a bottle. Patent medicines were aggressively marketed. Manufacturers developed distinctive trademarks and packaging for their products and created memorable advertising campaigns. Unique and sometimes charming, many trademarks became instantly recognizable, such as this gouty fellow found on packages of Blair’s Pills. Patent medicine makers were pioneers in the use of such advertising techniques as solicitation through the mail, the provision of free samples and promotional trinkets, national newspaper campaigns, outdoor signage, and testimonials. Popular patent medicine almanacs (free publications of 30 to 40 pages containing weather forecasts, horoscopes, and household and health advice) offered abundant advertising for the sponsoring companies’ products. Giveaways, such as a matchbook style needle and thread case from the Lydia Pinkham Company, were also used to boost sales. Before the beginning of federal drug regulation in 1906, patent medicine manufacturers made any therapeutic claims for their products that they wished. In addition, patent medicines often contained dangerous levels of alcohol, opium, and other narcotics, potentially addictive and deadly ingredients that were not revealed to the consumer. Unscrupulous manufacturers greatly exaggerated the curative powers of their remedies, selling them as “panaceas” or “cure-alls.” The aptly named Swaim’s Panacea purportedly cured all “blood diseases” including scrofula, chronic rheumatism, ulcers, old sores, boils and carbuncles, diseases of the spine, catarrh, and wasting. A long and extravagant listing of conditions for which a medicine claimed to be beneficial, such as this list found on a box of Dr. Flint’s Quaker Bitters, was a hallmark of patent medicine packaging. Citizens groups, legislators, and journalists criticized the medicine industry for these practices. In 1905 and 1906 Collier’s magazine ran a series of influential articles by Samuel Hopkins Adams entitled “The Great American Fraud,” which exposed many of the deceitful and unsafe methods practiced by patent medicine manufacturers. Such exposes helped to promote the first federal Food and Drug Act, signed into law by President Theodore Roosevelt on June 30, 1906. The act was amended in 1912, and an even stronger Food, Drug and Cosmetic Act passed in 1938. These laws required drug labeling to include a list of ingredients and prohibited manufacturers from making false and misleading claims. From 1906 to 1918 manufacturers could label their products with a “guaranty” that their medicine complied with the new food and drug law. The 1906 law required manufacturers to label their products if any of the following ingredients were present: alcohol, morphine, opium, cocaine, heroin, eucaine, chloroform, cannabis indica, chloral hydrate, or acetanilide. A complete listing of all ingredients was not required until 1938. Federal food and drug regulation continues to evolve. Amendments to the laws in 1951 established clear distinctions between prescription and over-the-counter drugs. More recently, new regulations have introduced the category of “dietary supplements,” whose health claims must be labeled as “not evaluated by the Food and Drug Administration.” Also, a “Drug Facts” label has been required on all over-the-counter medicines since 2002. Despite dramatic changes in medical knowledge and federal regulation in the past 100 years, self-medication continues to be a popular form of treatment for many Americans. Although no longer referred to as “patent medicines,” over-the-counter products today offer an enormous array of choices without requiring the consultation of a physician. Manufacturers of these remedies continue to rely on extensive advertising to reach the consumer directly, employing many of the methods pioneered by patent medicine marketers over 100 years ago.